I’ve visited Thailand four times in the past year… That’s proof of how much I love Thai food! We sort of have a “Thai town” here in Kowloon City – here you can get a range of local Thai products (like the menthol nose inhaler I once got hooked onto) and of course, authentic Thai food too. Friendship Thai is my favourite over there. But a lot of people have been recommending Chachawan. Although the no-reservations policy put me off at first, in the end, I waited just a brief 15 minutes on a Tuesday night at about 9pm. Apart from the green papaya salads, all the other dishes seemed pretty untraditional – but in an absolutely great way. There was a bit of creativity in the dishes, but the strong traditional Thai flavours were definitely present. I loved the intriguing variety, that made me feel desperate to return only one day later. 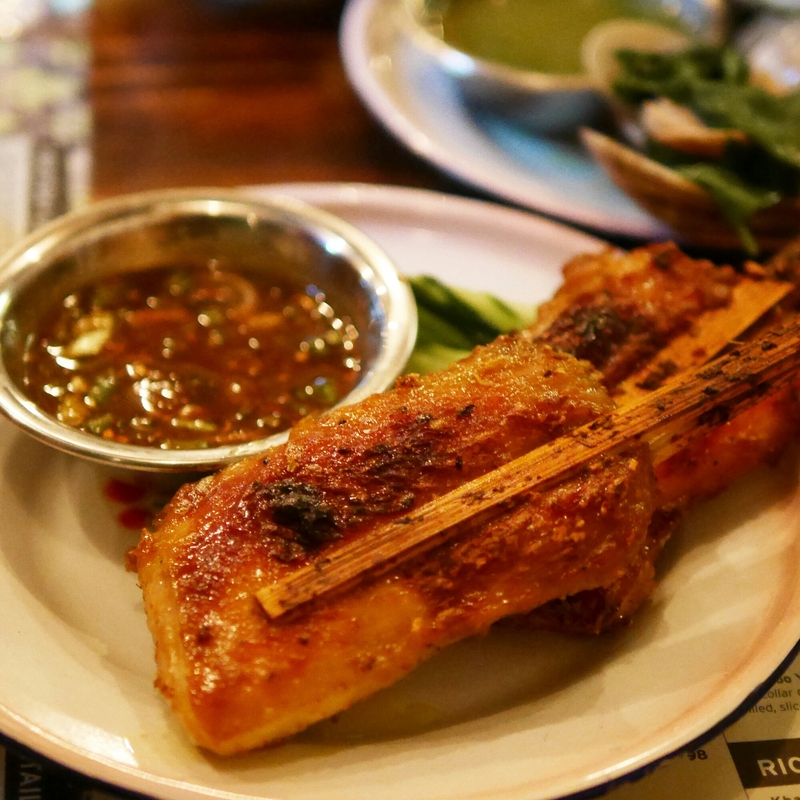 You can’t find these dishes in Kowloon City and that’s one of the reasons I love Chachawan! The papaya salad is legit. 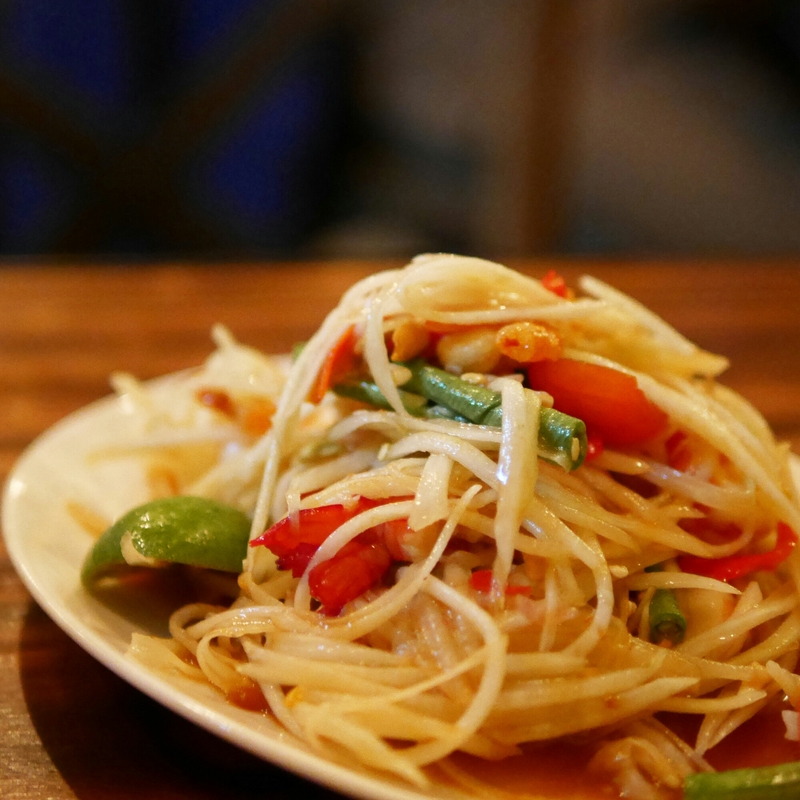 I recommended Som Tam Nua before (see Quick guide on where to eat local Thai)- a popular restaurant in Bangkok that boasts its amazing green papaya salads – and Chachawan may probably be even better. It is super crazy spicy though and I couldn’t finish one bite. So please request to have it less spicy if you’re not a high level spice taker. The waitress told me this dish would be “two skewers” and the above two slabs of thighs were served shortly after! They say it’s been marinated for 24 hours and the flavours definitely vouch for that claim. More impressively, the meat is extremely juicy and tender. Of course, as with many Thai dishes, the sauce was key and very tasty too! I wasn’t originally planning to order this because clams are clams, how good can they be? 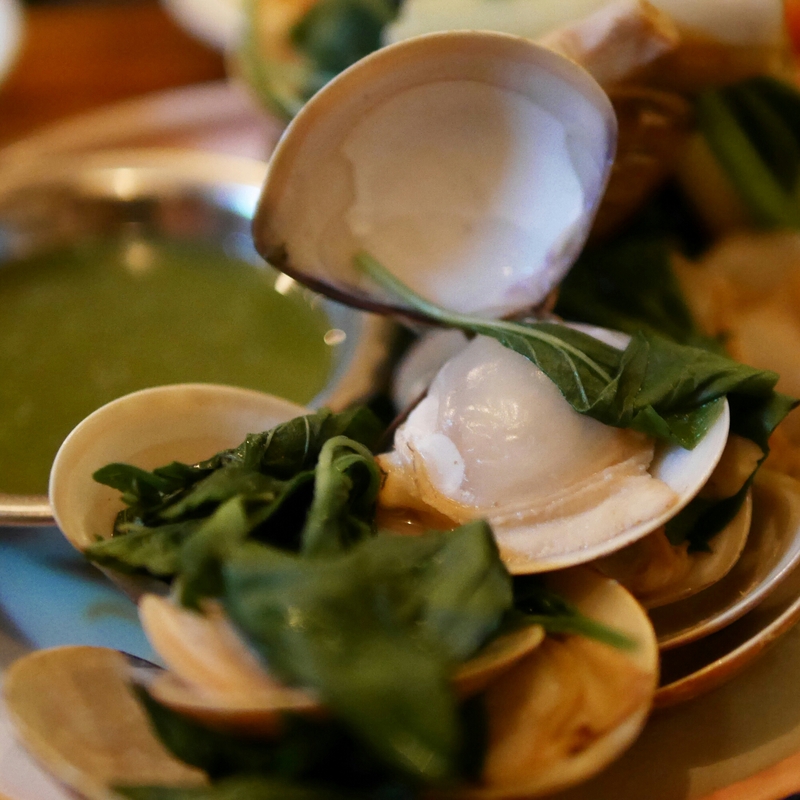 To my surprise, the clams were perfectly slightly undercooked, giving a raw touch to it. Importantly, the dip was my favourite! It tastes like the ones that come with Thai raw shrimps, except not ridiculously spicy! The waitress said “you can’t get this anywhere else” and we were that easily sold! It’s just a simple-tasting, delicious light dessert to end the meal. The texture is like mochi or rice balls, but it’s actually made purely of coconut. This is one thing you must save your stomach for. I’m always greedy for dessert so I ordered two! There was a lot of sticky sweet condensed milk in this. I liked it, but in general, it’s only boasting flavours we can all easily imagine and doesn’t live up to the other tastily original dishes! The verdict is, I’ll definitely be back (and be back soon). I was actually craving the clams and coconut dessert only the morning after. Apart from the dishes I described here, there are many other items on their extensive menu I’m excited to try (I heard good things about their crab fried rice). All in all, highly recommended to ALL! 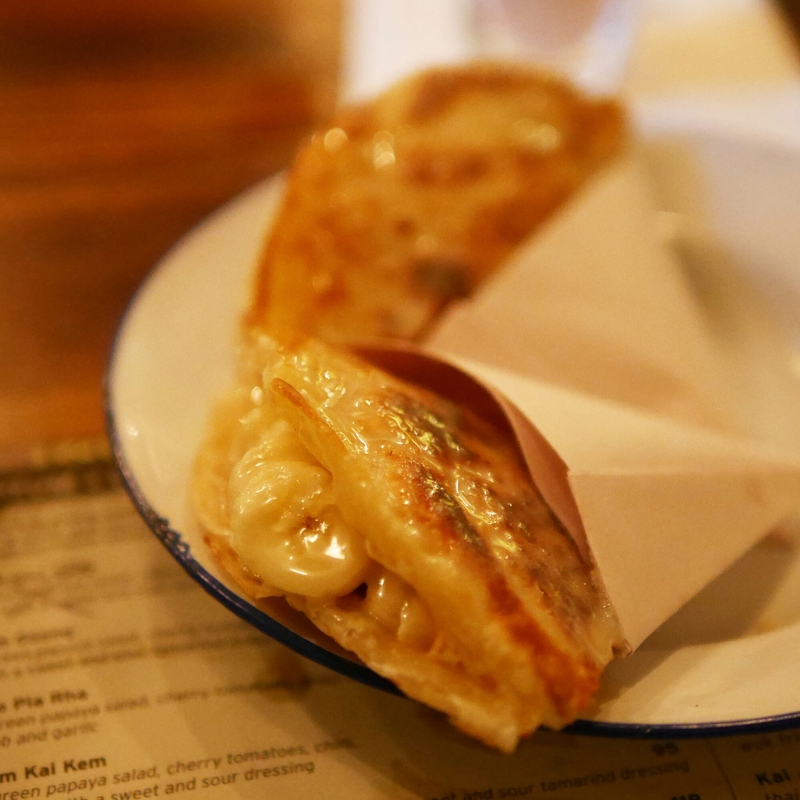 Chachawan is located on 206 Hollywood road, Sheung Wan. Unfortunately they don’t take reservations and usually there is a wait. But go put your name down and get some drinks nearby!